Happy Earth Day! It’s the one day each year all of us should stop and think about how we can help protect the environment. TDS has a great idea on how you can get started: recycle your old, unused or broken electronics. Hiding that old cell phone or power supply in your garbage bag might seem like a good idea today, but it’s not in the long run. As electronics get dumped or burned, mercury, lead, and other toxic materials can be released into the environment. In fact, a recent news report says, “…when the toxic chemicals contained in electronic waste is exposed, they can cause lung cancer, damage to the DNA, liver, heart and spleen if inhaled.” And, one of the ten most polluted places on the planet is an e-waste dump site! Yikes. What qualifies as electronic waste? Televisions (the tube kind and flat-panel LCD/plasma), stereos and speakers, radios, computers, cell phones, microwaves, CD or DVD players—pretty much anything with a screen or computer chip. The safest way to dispose of these items is to recycle them. 1. 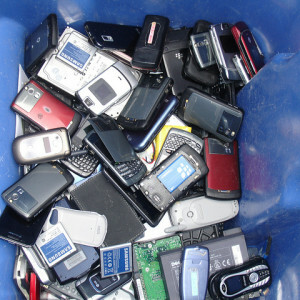 Visit Call2Recycle to find out where to recycle your old cell phone or batteries. By entering your city and state, you will get a list of the closest locations for dropping off your unwanted items. 2. Bring your old or broken electronics and appliances to Best Buy. They offer e-waste recycling at all of their locations, but what they’ll accept does vary. You can check what your local Best Buy will take here. 3. Call your local municipality. They likely will have tips and instructions for recycling e-waste so be sure to investigate before tossing your electronics in your trash. • Recycling one million laptops saves the energy equivalent to the electricity used by more than 3,500 US homes in a year. • For every million cell phones we recycle, 35,000 pounds of copper, 772 pounds of silver, 75 pounds of gold, and 33 pounds of palladium can be recovered (both numbers are from epa.gov). Our employees are doing their part. Today is the 7th annual TDS e-waste recycling event in Madison, Wisconsin. In the last four years alone TDS employees have recycled more than 35,000 pounds of e-waste! If you know of an e-waste recycling event happening in your area, share it in the comments! P.S. Of course, some of the best ways to be good to the earth is to buy earth-friendly products from the get-go. Here’s some inspiration for you from Mashable. P.S.S. And maybe, just maybe, sometime soon, lots of our gadgets will run on body heat!